Diving and snorkeling are mandatory activities when you vacation to Bali. This is because Bali is a small island, and borders other islands, so often used as an object for snorkeling. In addition to a healthy sport, diving and snorkeling gives you the impression. You will gain valuable experience to see the beauty of the unexpectedly beautiful sea life. 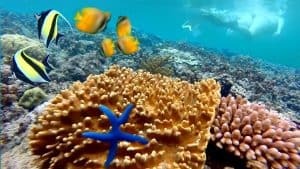 Here are the best beaches and island near Bali for snorkeling. The famous snorkeling site in Bali is Nusa Lembongan. Nusa Lembongan itself is one of the island cluster in Bali that can be reached by crossing. Precisely from the Port of Sanur, tourists need approximately 30 minutes to cross there using a speed boat. Not only snorkeling can be done there, but also other water sports tours. Spot snorkeling in Nusa Lembongan is also quite frequented by tourists. This is because access is fairly easy, and also natural underwater that is still natural. You will experience the great view of underwater near the island. It is more than beautiful. 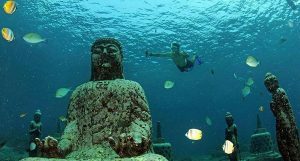 Besides Nusa Lembongan, Nusa Penida is also one of the snorkeling places in Bali that are frequented by tourists who like to enjoy the underwater environment. Tourist Places in Nusa Penida also visited by many tourists. Nusa Penida is also frequented by foreign tourists for diving or snorkeling. The interesting thing here is the existence of a historic underwater environment. Why is it called historic? It is because there is an area full of Buddhist statues. Spot is often used as an attractive snorkeling location by tourists abroad. Tulamben is also located in East Bali. Tulamben is suitable to be a snorkeling spot because of its natural beauty under the sea is very stunning and crisp. The specialty of Tulamben is similar to Amed, where there is a wreck of a world-wide shipwreck that sank there. But this ship does not belong to Japan, but reach to USAT Liberty Glo. 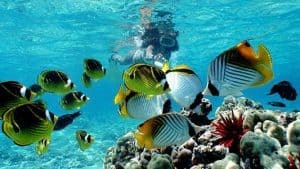 In addition, coral reefs in this area are also very exotic, complete with the presence of marine biota with all kinds of colors that show the beauty of the Almighty. Serangan is the name of an island that can be reached from Denpasar quite easily. Serangan are not quite crowded because not many tourists who know this location. But this island has a snorkeling area with beautiful coral reefs for further exploration. His name is Safari Underwater Park. There are different types of marine biota. This snorkeling location is a conservation owned by local fishermen. The goal is to restore the natural values around the island. Serangan is almost damaged due to the reclamation done in the area. Another snorkeling site in Bali is the Blue Lagoon. Blue Lagoon is in eastern Balu. This snorkeling spot is a snorkeling location where the water is clear with sloping soft sand. Some types of marine life that can be seen are cow fish, turtles, reef sharks, murray, and morish idol. This location is suitable for tourists who like to take pictures under the sea. However, snorkeling here can not be done any time. Because when the weather is choppy, visibility will shrink. Snorkeling can only be done when the weather is calm. Who does not know Tanjung Benoa? Definitely every time a trip to Bali, Tanjung Benoa become one of the tourist destination. This is because in this place there is a very complete water game rides. There is also Turtle Island which is a Child Tourism Place in Bali to learn various kinds of animals from Tanjung Benoa. For diving in Tanjung Benoa, snorkeling can be done at some recommended spots. Besides snorkeling, there is also another way to enjoy the underwater world, namely by sea walker. This way is quite simple, where the tourists just need to use a special helmet and into the water. Uniquely, tourists do not need to have the ability to swim, because everything can run in the water. Sanur Beach is famous for beautiful sunrise scenery. But who would have thought that Sanur also has a dive area that is not less beautiful with Tanjung Benoa. In Sanur there is also one spot for sea walker. Although not as beautiful and seramai Tanjung Benoa, but trying watersport and enjoy the underwater scenery in Sanur can also be one alternative. In addition, snorkeling in Sanur can also be done in some spots. But it is said Sanur water is not as clear as other snorkeling spots in Bali, so the visibility is quite limited. Jemeluk Bay is near Amed. Jemeluk Bay is also one of the coolest snorkeling sites in Bali. Its specialty is to snorkel on a cape. The current on the headland is certainly quieter than on a regular beach. Therefore, snorkeling in Jemeluk Bay can be done with more relaxed and not anxious carried away the current. There is also one of the snorkeling spots that provide views of the temple under the sea. Besides the beaches of Jemeluk Bay is also a beautiful and recommended white sand beach. One more snorkeling spot that can be used when traveling to the Island of Gods is the snorkeling spot in front of Pondok Vienna Beach Bungalows & Restaurant. From Jemeluk Bay, it only takes a distance of approximately 5 kilometers to get there. The specialty of this Vienna beach is the sand that is not white, but rather darker. But the location of snorkeling in the sea water is very beautiful. 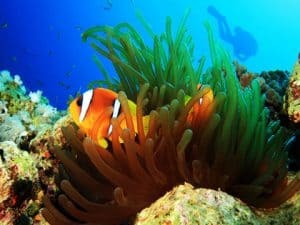 There are many coral reefs there and can be enjoyed safely while diving. Lovina Beach is also one of the beaches which name is quite famous. This is because the beauty of the beach is very beautiful and can be enjoyed, either with snorkeling or not. 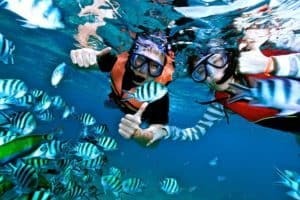 For snorkeling at Lovina Beach, you can rent snorkeling equipment as well as boats to help find the best snorkeling spot. Usually there is also a guide that helps. 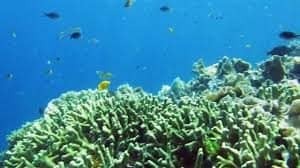 The privileges of snorkeling spots in Lovina are beautiful coral reefs, complete with a variety of fish and other marine biota that increasingly add to the beauty of natural scenery under the sea. Pandawa Beach is one of the Most Beautiful Beaches in Bali that has recently become known. This is because this beach has an interesting water sports spot to try. The most interesting water sport is the cano. In addition, the wisatwan also can do snorkeling at this Pandawa Beach. But the beach is very hot, because it is in the limestone hills. Another interesting point of this beach is the decoration of the carved limestone hill, similar to Garuda Wishnu Kencana area which is also a panorama of limestone carved hills. Menjangan Island is one of the Tourist Places in Bali that can be accessed also from Banyuwangi. Package tours Banyuwangi sometimes also menyedikan Menjangan Island tour as one of the tourist spots. To reach Menjangan Island, from Pelabuhan Labuan Lalang takes 3 hours. This location is indeed one of the famous snorkeling locations and often dijujoda tourists. For tourists who want to snorkel, you can bring your own snorkeling equipment. If you do not have, then do not worry, because there will be rental of snorkeling equipment that can be used. Amed is another spot in Bali that can be used for snorkeling. This spot is also a favorite spot that tourists often visit, especially tourists who want to spend time in the East of Bali. Amed has a stunning panorama. 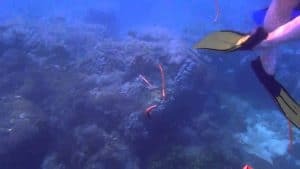 For snorkeling in the Amed area, even tourists do not need to use a boat to cross, because on the seashore even the underwater scenery is stunning. 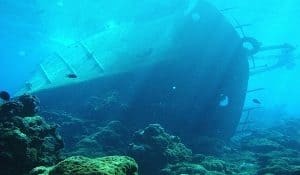 The specialty of this snorkeling location is the existence of the shipwreck of the former World War II of Japan. Currently the spot is known as Japanese Shipwreck. 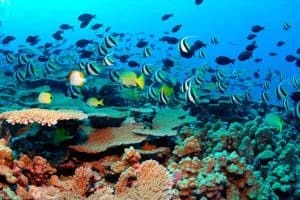 Those are the best beaches in Bali for snorkeling. You might find some of them are wonderful. It would be unforgettable moment during your life.